Residential and Commercial Sanitation and Recycling services are setup and billed through the Guntersville Water and Sewer Board. For information about setting-up new service or questions regarding your bill, call the Guntersville Water and Sewer Board (256) 5931. For pick-up schedules and other questions call (256) 571-7598. Household garbage should be placed in ridged 32-gallon containers with lids. Liners alone cannot be used. Each household may receive weekly service for no more than two containers. Litter from your garbage is your responsibility. Recycling is required by city ordinance. All accepted recyclables should be rinsed diverted from the garbage going to the landfill. 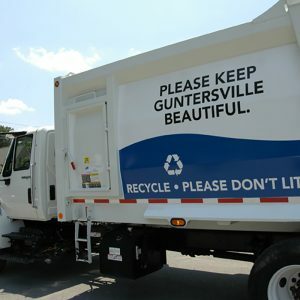 Blue bags are provided by the City of Guntersville for recycling collection usage ONLY. Garbage is collected on Thursday and Friday. Commercial waste pickup is coordinated on a case-by-case basis depending on the needs of each individual business. Please contact us at (256) 571-7598 to schedule an appointment with the Sanitation Department.